Buy a Love and Hate calligraphy wall scroll here! Whether you want to make a joke about what marriage really is, or just feel that the world in full of love and hate, this selection is for you. 愛與恨 happen to literally translate. So the first character is love. The middle character is a connecting particle like "and" in English. The last character is hate. Upon request, we can omit the "and" character and just put a dot to separate love and hate if you prefer. 愛憎 is a weird selection for a calligraphy wall scroll. But if you really want it, we'll do it. This version is most appropriate if your audience is Japanese or Korean (for Koreans who can read the ancient Korean Hanja). The first character means love or affection. The second character means hate, dislike, detest, or loathe. Not the results for love and hate that you were looking for? The seven emotions : pleasure, anger, sorrow, joy, love, hate, desire. 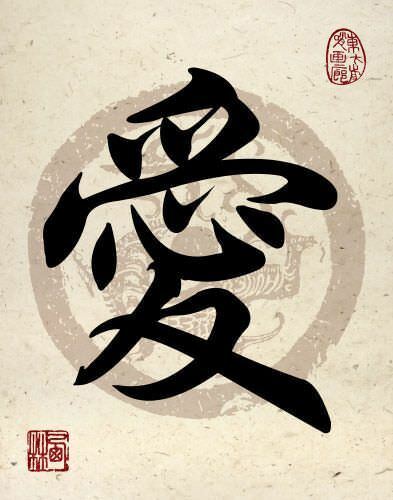 The three poisons, also styled 三根; 三株; they are 貪 concupiscence, or wrong desire, 瞋 anger, hate, or resentment, and 痴 stupidity, ignorance, unintelligence, or unwillingness to accept Buddha-truth; these three are the source of all the passions and delusions. They represent in part the ideas of love, hate, and moral inertia. v. 智度論 19, 31. (心所法) Mental conditions, the attributes of the mind, especially the moral qualities, or emotions, love, hate, etc. ; also 心所有法, v. 心心. Some people may refer to this entry as Love and Hate Kanji, Love and Hate Characters, Love and Hate in Mandarin Chinese, Love and Hate Characters, Love and Hate in Chinese Writing, Love and Hate in Japanese Writing, Love and Hate in Asian Writing, Love and Hate Ideograms, Chinese Love and Hate symbols, Love and Hate Hieroglyphics, Love and Hate Glyphs, Love and Hate in Chinese Letters, Love and Hate Hanzi, Love and Hate in Japanese Kanji, Love and Hate Pictograms, Love and Hate in the Chinese Written-Language, or Love and Hate in the Japanese Written-Language. 108 people have searched for Love and Hate in Chinese or Japanese in the past year.